Imagine that you’re putting together a fantastic concoction for dinner, a recipe you found that you’ve been dying to try and are extremely excited about. You get halfway through, and the recipe calls for a specific herb or spice. You’re used to having a full spice rack, so you simply reach for the herb, only to find you’re completely out. You go into panic mode – this particular ingredient is essential to the flavor of the entire meal. You know this because you know your herbs well. You’re too far into the cooking process to retreat and make something else, so what are you going to do? 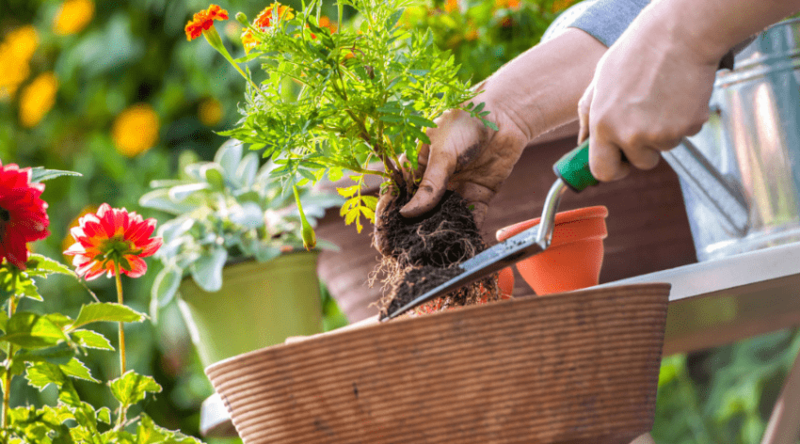 If you’re serious about your herbs, you may have your own herb garden. If that’s the case, you’re in luck because you can always adjust a recipe to take fresh herbs in place of the dried ones it calls for. Simply increase the amount with a ratio of 1 teaspoon dried herb to 1 tablespoon fresh herb (3 times as much for the same effect). Of course, it’s entirely possible you don’t have either one. In that case, it’s time to start using herb substitutes. 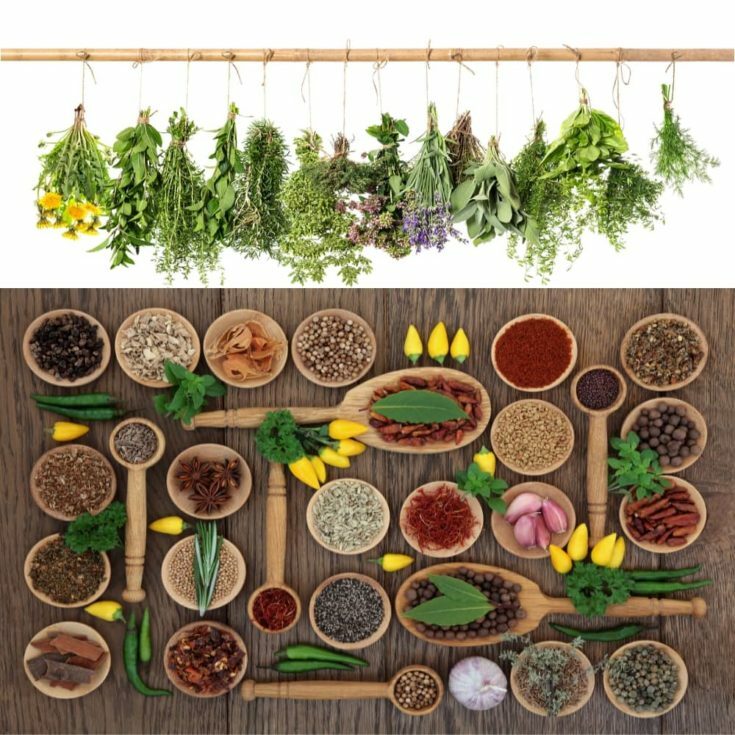 However, to assure you have what you need, you should first consider what’s required for proper herb picking and herb storage so that your ingredients are ready to use – and so you hopefully never run into a situation where you need to use a substitute. Whether you grow your own or purchase them at the supermarket or local grocer, you should be careful when picking your herbs. 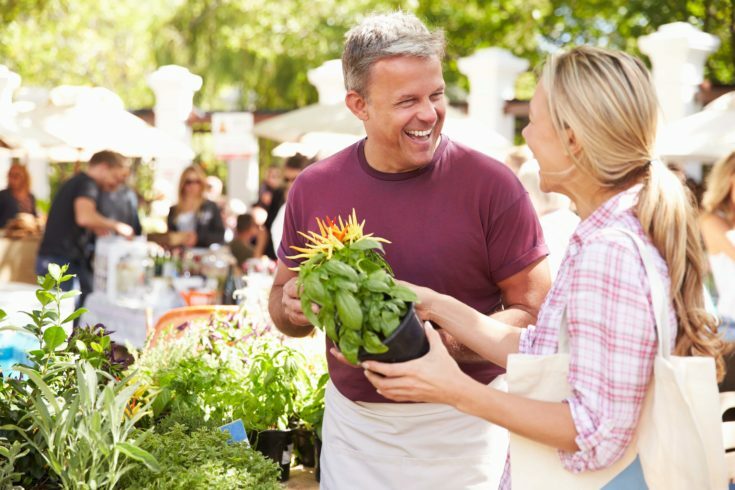 Here are a few tips to help you save money and get the best results. 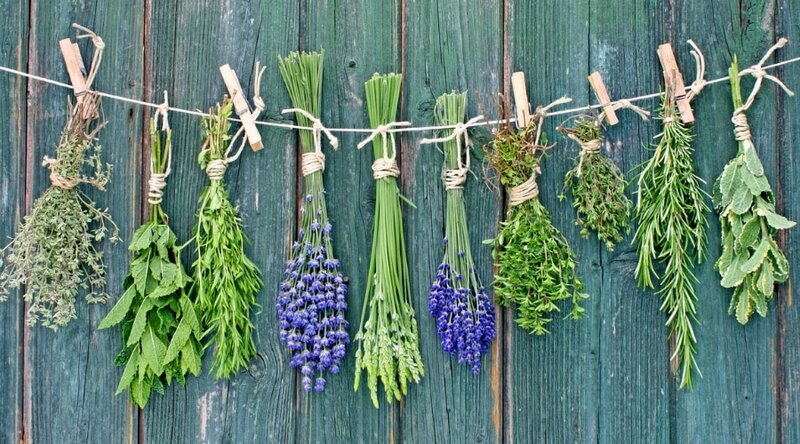 If you grow your own herbs, be sure that you only pick what you need at the time unless you’re going to dry them. Fresh herbs don’t last long, and you don’t want to waste what you’ve grown. By the same measure, if you’re purchasing herbs from the store, make sure to only purchase what you’re going to use in the next few days since fresh herbs won’t keep long. Avoid herbs that have brown spots or look the least bit withered or wilted. These are not fresh enough and will have a tainted flavor, as well as end up useless to you within a day or two. Pick herbs that are leafy and green, looking as though they are thriving and freshly cut. These will last you longer (relatively speaking) and give you better flavor in your recipes. Taking these steps will avoid any issues with the need for fresh herbs. In fact, keeping them fresh so they are available at a moment’s notice isn’t that difficult. While they will never last a very long time, you can extend the life of fresh herbs with a little care so that you don’t find yourself in that panic in the middle of cooking for a crowd. 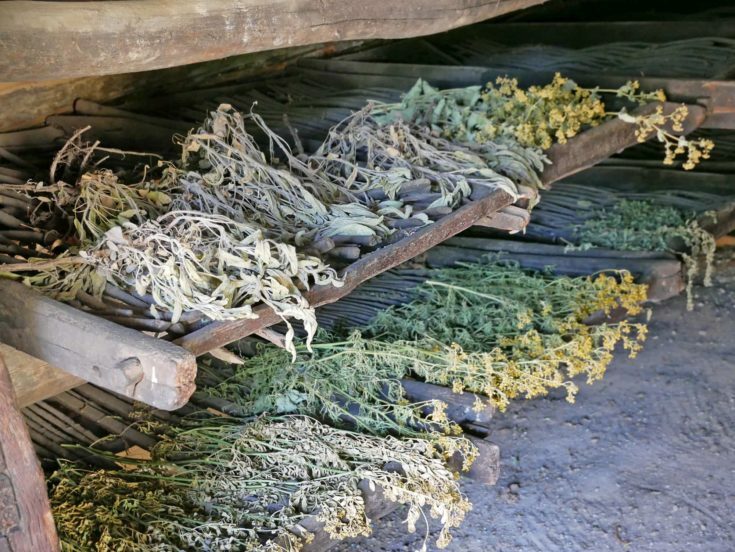 Take these steps to assure the longest possible life of your herbs. Start by cutting off ½ inch of the stems of your herb. This will open them up, as with flowers, to absorb water. Take a jar or glass and put a little water in the bottom. Then, stand the remaining stems in the water inside the jar. Loosen the leaves so they aren’t clumped together. This will allow more air flow so that the leaves can breathe. Cover the top with a small plastic bag and place the entire jar in the refrigerator to keep. Note that you should not store basil in the refrigerator, as this could lead to it turning black and ruining. 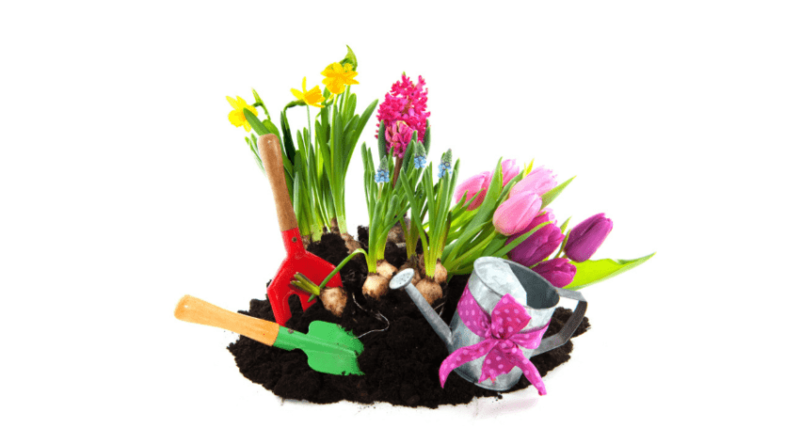 Check the herbs daily and remove any wilted and dead leaves to keep the herbs as fresh as possible. Storing your herbs in such a fashion will not only make them last longer but will also create a scenario where checking them regularly, you’ll be more aware of when you’re low on one ingredient or another and can use the reminder to purchase or pick more for your use. Then, you’ll never need to worry about substituting anything in a pinch. While there is a process to dry herbs over time, there is a quick way to do it, so you have dried herbs for your use the same day. Believe it or not, the microwave comes in handy to assure you have the dried ingredients ready to go, and all you have to do is read the recipe in advance and check your supply, so you can quickly and effectively refill your supply if necessary. Find the fresh herb you need, either in your refrigerator, your garden or at the store. Grab a paper plate or paper towel and lay your herbs flat out on it in the microwave. Set the timer for 1-minute intervals, allowing some standing time between each session, and check in between for dryness. Depending on the herb and how fresh it is, this may take several rounds, but a few minutes is a very short time to get the desired results, so you can follow the recipe as it’s written. 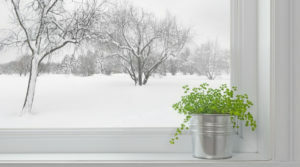 If you use a lot of herbs and don’t get a lot of time to harvest or shop, you can always purchase them, you can always collect them in advance and freeze them so that all you have to do to prepare for your meal is defrost them in advance. Of course, if you plan ahead, you can dry your herbs in the traditional manner. Gather 3 to 6 branches of the herb and tie the stems with string or yarn. If you don’t have that, use a rubber band to keep them together. Hang your bundle upside down in a dry, dark area. Hanging them in the sun will take away color as well as scent and flavor. Try an attic or basement that is well ventilated, or maybe a storage closet in your home. Check daily after the first week. It usually takes a couple of weeks for the herbs to fully dry. When they are ready, the herbs will be brittle to the touch. Remove the dried herbs from their bundles and store them in airtight jars, bottles, or bags for safekeeping until you’re ready to use them. When using dried herbs, you want to first crush them, as this will help release the flavor sealed inside. There are two ways to do this that are very simple. Place the herb in your palm, and use the thumb of your free hand to press and rub, or rub between your thumb and forefinger of one hand, letting the crushed herbs fall into a container. Mortar and pestle. 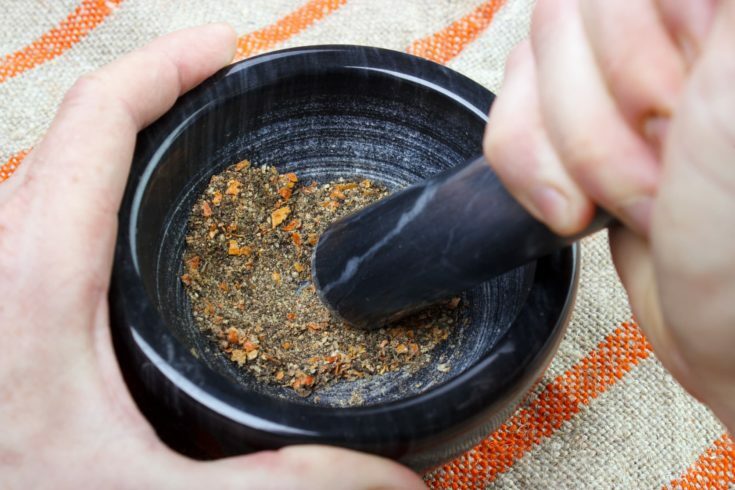 Put the herbs in a mortar and gently use the pestle to crush the herbs to the desired consistency. When you’re done, the dried herb is ready for use. This should typically be done shortly before use so that you catch the most flavor in your recipe from your herbs. Freezing fresh herbs is a great way not only to be prepared but also to save any herbs from your garden that you need to harvest but don’t feel you’re going to use immediately. 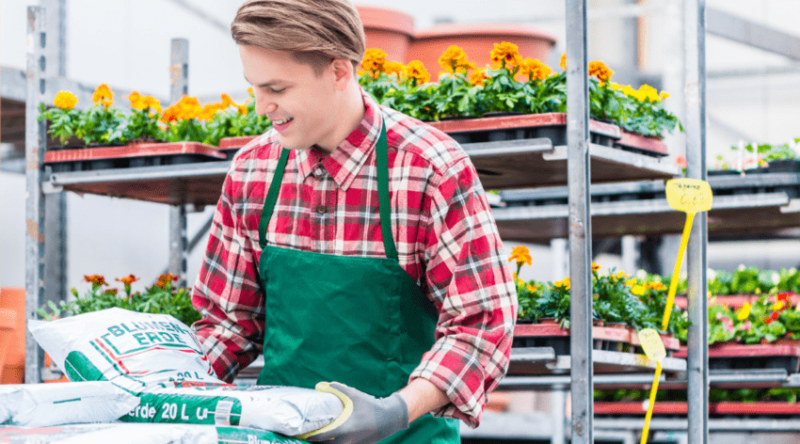 This often happens in the summer, when you get an abundance of growth, and can come in handy in the winter when you have a less fresh product to work with. Start by washing the herbs you’ve harvested and intend to freeze. Pat them dry; you don’t want any water left on them since this can cause freezer burn over time. If you have lemongrass or chives, you should chop these prior to freezing them. They are quite thin and will freeze in minutes if not chopped, faster than other herbs. For all others, lay them flat in a single layer on a pan and put them in the freezer. 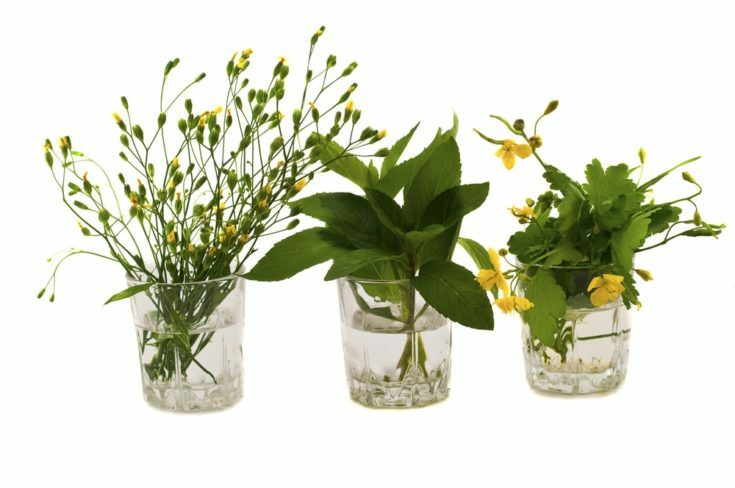 Once the herbs are frozen, you should store them in labeled and sealed containers so you can easily read what is inside. Add the date you froze them so you always pull the oldest first. Be sure to push all the air from the container prior to sealing it. Then, store it in the freezer for later use. Make sure the temperature in your freezer is appropriate, set to about 0 degrees Fahrenheit. You need to assure it’s cold enough to properly keep herbs and other foods completely frozen. Also, make sure you use freezer rated containers that seal well, whether bags or other containers, so that you avoid freezer burn and ruination of your herbs. You can also use a glass jar that has a tight-fitting lid, such as a canning jar, as all of these tend to be rated for refrigerators and freezers. There are other reasons you may not have what you need for your recipe. At times, you simply run out of space and can’t keep every herb in your collection at all times. That doesn’t mean you can’t make an amazing meal. As noted, you can sometimes substitute another herb for a similar flavor, or you can get creative and make the recipe your own. For example, a lot of people who don’t like onions or have an allergy to them will simply replace onion in a recipe with garlic. If you aren’t sure what to use in the place of the missing herb and desire a similar taste, here are some pointers on what herb substitutes will work best. Be aware that, unless otherwise noted, you can typically use a 1 to 1 ratio for replacement. This isn’t a complete list, there are others like herb substitutes for salt or substitutions for poultry seasoning that depend on your tastes but it should get you through the worst of the issues you run into since these are all quite common. Likely, you have one of the substitutes, if not the required herb or spice, available in your collection, either fresh, frozen or dried, and you can make the replacement work. It’s essential to wash and dry your herbs prior to chopping them. Be sure to wash with only cool water. You can pat them dry or put them in a salad spinner to drain and dry them. If you don’t get them dry, you’ll find that they cling to all your kitchen utensils, including knives and measuring cups or spoons, and that’s the last thing you want. Before you start chopping, remove tough stems from the herbs and discard them. The stems that are close to the leaves will be softer, which means these can be cooked and eaten and don’t need to be removed. 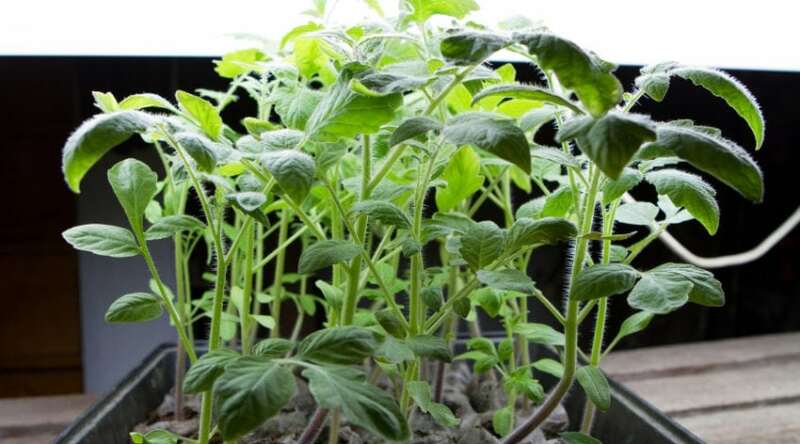 However, for herbs with large leaves – such as mint, basil, and sage – you can simply strip the leaves from the stems for use and discard all the stems. Herbs with woody stems require a little extra work. For rosemary, thyme, and similar herbs hold the stem with one hand and strip the leaves into a bowl with the thumb and forefinger of your free hand. Note that the leaves on thyme are probably going to be small enough that they don’t require chopping. Consider using kitchen scissors rather than a knife for the quickest, easiest method and cleanup. Simply place your leaves in a measuring cup and make swift, short strokes to cut them up. Avoid the food processor method unless you are combining your chopped herbs with olive oil or some other ingredient. A food processor will likely chop the herbs too finely and make them difficult to use. If you’re going to use a knife, choose a good chef knife from your collection that fits well in your hand and is easy to wield. 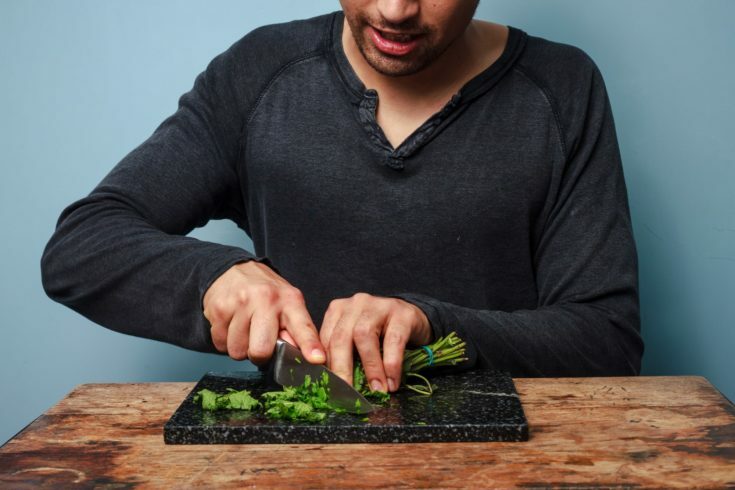 Place your herbs on a cutting board or cutting surface and use a rocking motion with the knife from tip to heel, making sure to chop your herbs to the size you want. If you have a large number of herbs to chop, this is the recommended way to do it. Another method of ‘chopping’ is to chiffonade, which, in French, means ‘made of rags’ and refers to cutting the herbs into thin, ragged strips. This is not only an attractive way to present fresh herbs but also a good way to release their flavor for a stronger overall appearance in your recipes. It’s also much quicker than chopping. Start with an herb that you’re going to use right away. Roll the herb leaves up, starting at the long edge of the stack. Use your chef knife or something smaller and very sharp to slice the roll into very thin strips. Aim for 1/8 inch or thinner. When you’ve finished, you’ll have a pile of herb ribbons to unroll and use. This saves time and gives you something beautiful and flavorful to add to whatever you’re cooking. 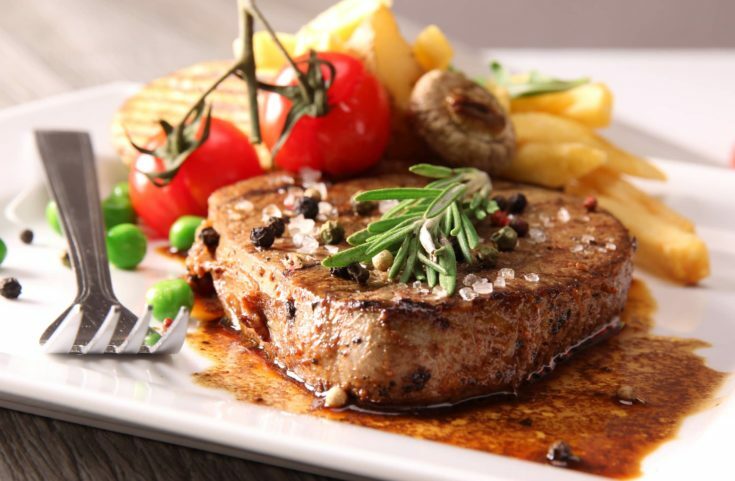 Consider that your food will look and taste like it was cooked by a professional chef. If you’re used to having dried herbs, you may not be certain how to work with fresh herbs that you’ve chopped. Here are some suggestions to help you along the way. Always add your herbs at the beginning of the cook time. This gives them more time to release flavor into the food you’re serving. Snipped cilantro is a great garnish. Sprinkle it on tortilla soup, tacos, and chili right before serving. If you’re grilling steaks or roasting chicken, you can combine several herbs for a great baste. Mix together snipped fresh rosemary, salt, ground black pepper minced garlic, and olive oil. Then, brush over the meat. If you’re looking for a light dessert, you might be interested in berries or fruit. To spice it up, take sliced strawberries and toss them in a chiffonade of mint leaves and a spoonful of sugar. Add flavor to steamed broccoli or asparagus by tossing them in melted butter you’ve spiced up with snipped fresh thyme leaves. Fresh flat leaf Italian parsley also dresses up a number of dishes. Snip it and use it with omelets, pasta, or vegetable soup, adding the garnish just before you serve the dish. Of course, you want to have the herbs available that a recipe calls for, especially with so many uses in mind for each. However, if you know how to use herbs interchangeably, you’ll save yourself a lot of trouble and even space in your kitchen. In addition, learning how to store herbs, whether dried or frozen, can help make sure you have everything you need at any given time. Preparation is key, and you don’t have to work hard far in advance. 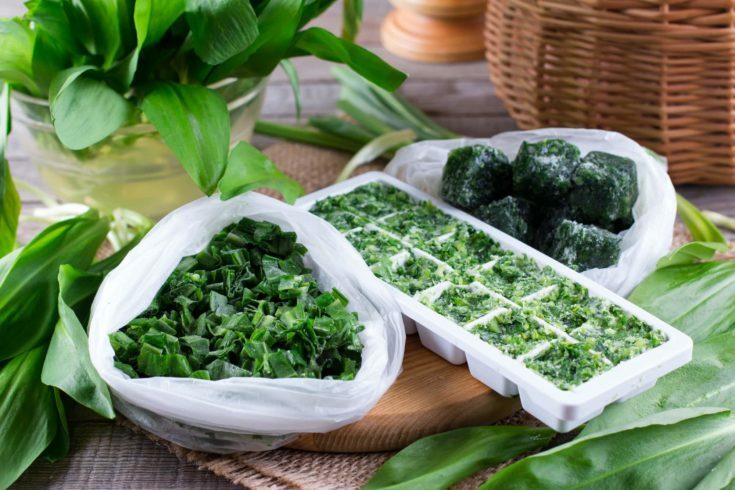 With quick drying methods in the microwave, easy use of frozen herbs without having to defrost them, and multiple ways to crush or chop herbs, you can always have what you require ready at hand. And if you are short on something, keep a list of substitutes available at the ready, perhaps as a file in your phone or a paper list posted in your cabinet. This will help you out quickly in a pinch, so you don’t get frustrated or go into a panic over the situation. When all else fails, get creative. 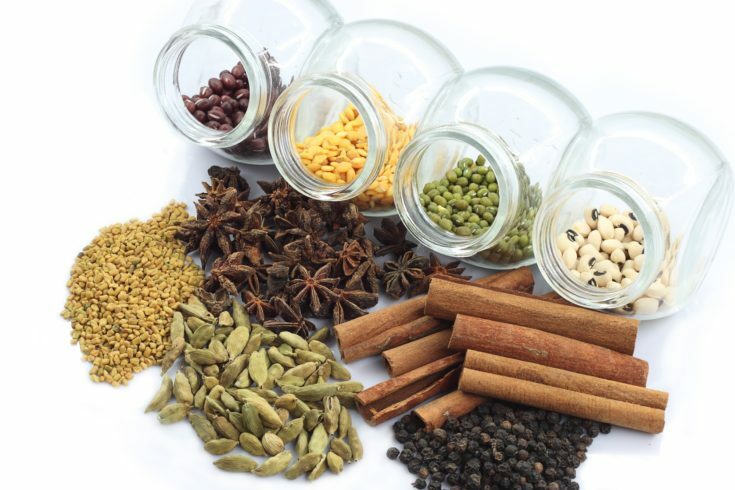 If you use a lot of spices and herbs and cook a lot, you know your flavors and what goes well together. Adjust the recipe to your own with a substitute you feel will make a delicious addition to your concoction. Trust your judgment, and smile as you prepare something amazing to share with friends or family or even for your own personal enjoyment.